I've been o.b.s.e.s.s.e.d. with the Dee-Dee Phillip Lim booties since... ever. I spotted them last year, and couldn't get these beauties out of my mind. Measure. And... measure, make paper templates and measure again. * cut 2 pieces of dark brown leather 12" x 2" and 2 pieces 12" x 1-1/2"
* on the wrong side of the leather, mark an horizontal line at 1/2"
Because this was pretty much a project of trials and errors, I realized that I didn't have enough leather (since I used scraps from my stash...) to make two complete wraps around the ankles, so I ended up making with the leftovers pieces of leather, two more pieces of fringes with grommets of about half the size of the previous one, and stitched under the longer ones. * cut 4 pieces of leather 3" x 5-1/2"
do the same on the other side of the cord and repeat for the next set of tassels. 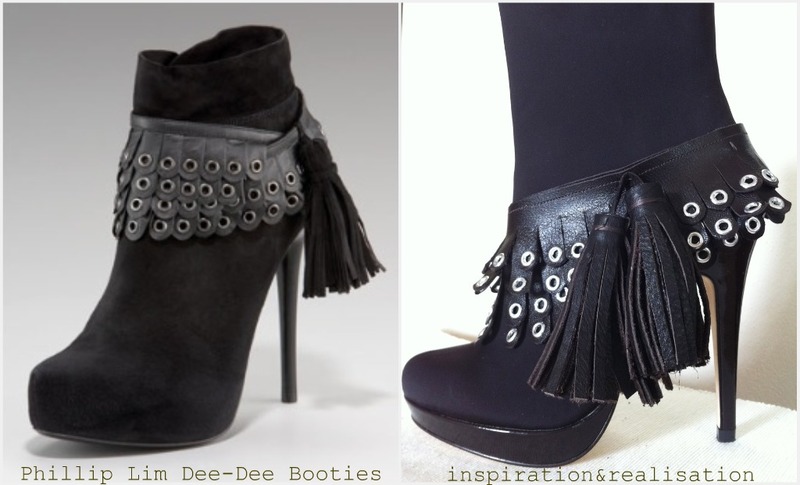 boy, this looks complicated, but the final result is stunning: your boots are just the same as the original!!! well done! Holy. crap. Those are awesome! Ooh what an amazing DIY - you did fantastic work! Love these - nice work!!!! Awesome job! They look so professional. 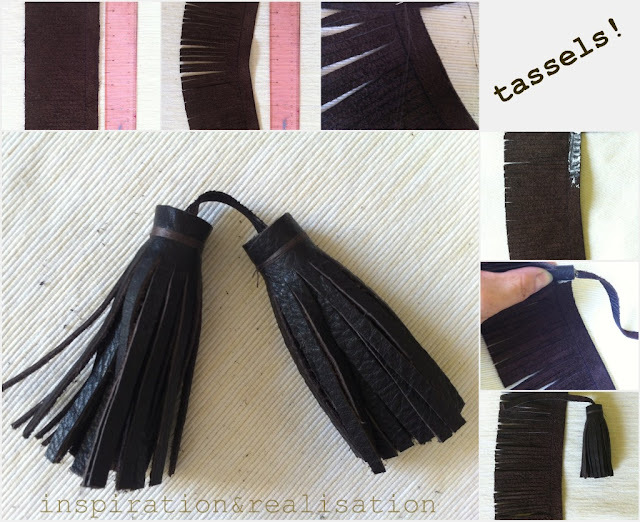 they're soooo cute and I'm never bored of fringes and tassels! They look great! OMG that's a lot of grommets to set. Your booties look better than the original. Love the tassel! Absolutely LOVE your boots. I think they're nicer than the original! Wow how sweet! I have a pair of plain black booties that could use this treatment. 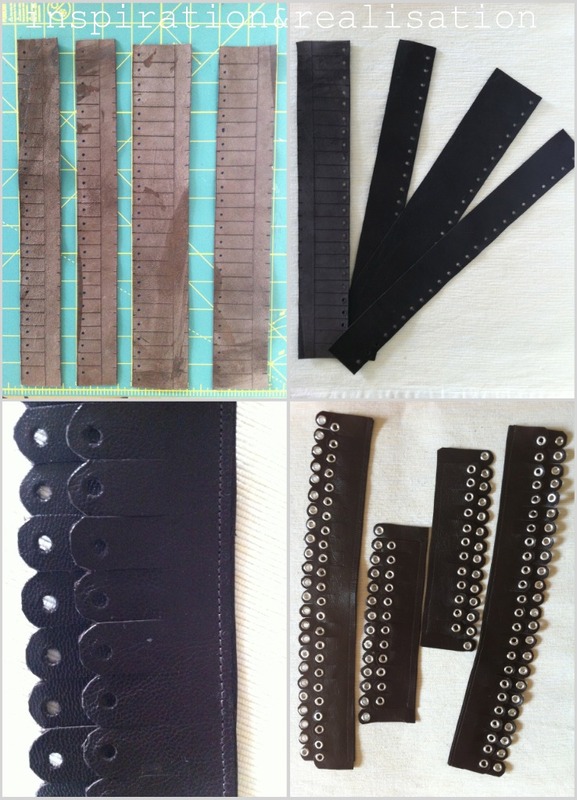 And being I have a ton of scrap leather and eyelets, I just may have to copycat your idea! Thanks for posting this beautiful project! Love this, the tassels are so cute.